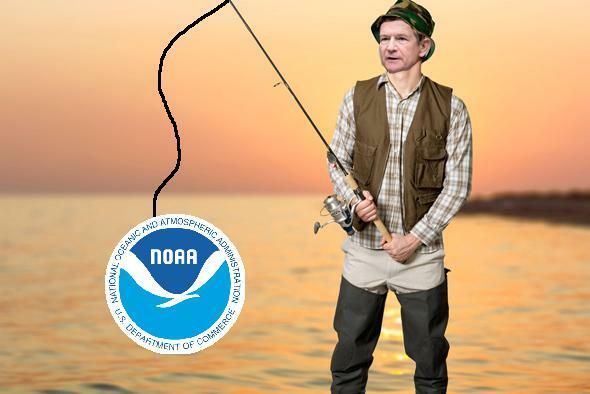 Lamar Smith broadens his attacks on NOAA scientists. Photo illustration by Phil Plait. Photos by NOAA, Shutterstock/www.BillionPhotos.com, and Brendan Smialowski/Getty images. Rep. Lamar Smith (R-Texas) is the chairman of the House Committee on Science, Space, and Technology. In a Congress full of ironies, this is the ironiest: Smith is a full-on climate science denier, a man who thinks scientists are part of a cabal plotting and planning and weaving false data to make it look like the Earth is warming. I wish I were exaggerating even a little. Worse, Smith has the power to enact his ideations. He has been harassing the scientists and administrators at the National Oceanic and Atmospheric Administration for months now, making unreasonable demands based on his beliefs. He took an ax to NASA’s Earth science budget (because NASA builds satellites to monitor climate change). He wrote an embarrassingly wrong op-ed in the Washington Post denying global warming. He issued a subpoena to NOAA chief Kathryn Sullivan (a scientist and former NASA astronaut), trying to strong-arm her and her agency into releasing a huge amount of information about scientists and their methodologies for analyzing climate data. He accused these scientists of altering data to suit their “climate change agenda” (shocker: No, they’re not). When Dr. Sullivan refused to comply, he made more nonsensical statements about warming. And there we stood for a while, but now Smith has ramped up the pressure again. In a new letter he sent to Dr. Sullivan, he has widened his search considerably. He is now demanding that she hand over emails from NOAA scientists that have keywords in them like—and I wish I were making this up—temperature, climate, and change. Yes, seriously. He might as well ask for ones containing the and and. To be clear: He’s asking for essentially every single email ever sent by any climate research scientist at NOAA. Does that sound like someone who is trying to find the truth, or more like someone who is desperately looking for anything to shore up his nonsense? Smith reminds me of a terrible fisherman who throws a stick of dynamite into a pond. Everything is killed and floats to the top, where he can sort out what he wants and ignore what he doesn’t. Any collateral damage be damned. Andrew A. Rosenberg, director of the Center for Science and Democracy at the Union of Concerned Scientists, wrote a letter to Smith asking him to drop this ridiculous investigation. Rosenberg calls this latest tactic a fishing expedition and a “sledgehammer of a congressional subpoena,” saying that this abuse of subpoena power can damage scientists’ ability to do their work. But it doesn’t take a conspiracy theorist to presume that this has been Smith’s intent all along. Despite overwhelming scientific evidence and consensus—and I’m sure the hundreds of thousands of dollars he’s received from fossil fuel interests has nothing to do with this—he seems very much dedicated to stopping any and all research into global warming. Mind you, all of this was sparked by a paper published by NOAA researchers showing that the so-called global warming pause doesn’t exist, giving Smith the excuse to go on this tirade. Smith constantly abuses climate science, misrepresenting it to suit his ideology. It’s a sad display by someone who has the power to do so much good when it comes to science. Smith faces a re-election this November. Texans of the 21st district, I urge you to vote against him. Given his voting numbers from past elections, this seems unlikely, I know. But Smith is an embarrassment on the global stage, a man who denies the basic science even as temperature records are shattered one after another. It’s this simple: He needs to either stop abusing science, scientists, and the scientific method, or he needs to go.